Also known as: Cascade Lake, Chub Lake, Pigeon Lake, Upper Sister Lake, Lower Sister Lake, Mays Pond, Gull Lake, Russian Lake, Constable Lake, Merriam Lake, Windfall Lake, Queer Lake, Shallow Lake. Add Lakes of Pigeon Lake Wilderness Pictures! Little-known and seldom publicized, the many lakes in the Pigeon Lake Wildernes provide an opportunity for solitude and pleasant outdoor exercise for the public. Located in the central region of Adirondacks Park in Hamilton and Herkimer counties, the 50,000-acre roadless wilderness encompasses at least 64 bodies of water. The area isn't crowded, because few are aware of its existence. Most Adirondack Park publications do not mention Pigeon Lake Wilderness, so its lakes are a well-kept secret. Located near better-known Big Moose Lake, the Pigeon Lake Wilderness contains over 45 miles of hiking trails. Many are positioned to intersect, so loops can be made from several different configurations. Trails range in level of difficulty and are often wet, although few have much elevation change. Some of the more notable lakes in the Wilderness (meaning they have marked trails associated with them) are Chub Lake, Pigeon Lake, Upper and Lower Sister Lakes, Mays Pond, Gull Lake, Russian Lake, Constable Lake, Merriam Lake, Cascade Lake, Windfall Lake, Queer Lake and Shallow Lake. Six lean-to camping shelters are scattered along the lakes, although most reports claim all but one of them can be reached only by boat. Streams to the lakes may be impassable by canoe or kayak due to fallen trees, swampy margins and other obstacles. All lakes show trails to them, although many are secondary trails that are not maintained and may require what some hikers refer to as 'bushwhacking'. None of the lakes are included on state Department of Environmental Conservation lists, so there are no statistics available for any of them. 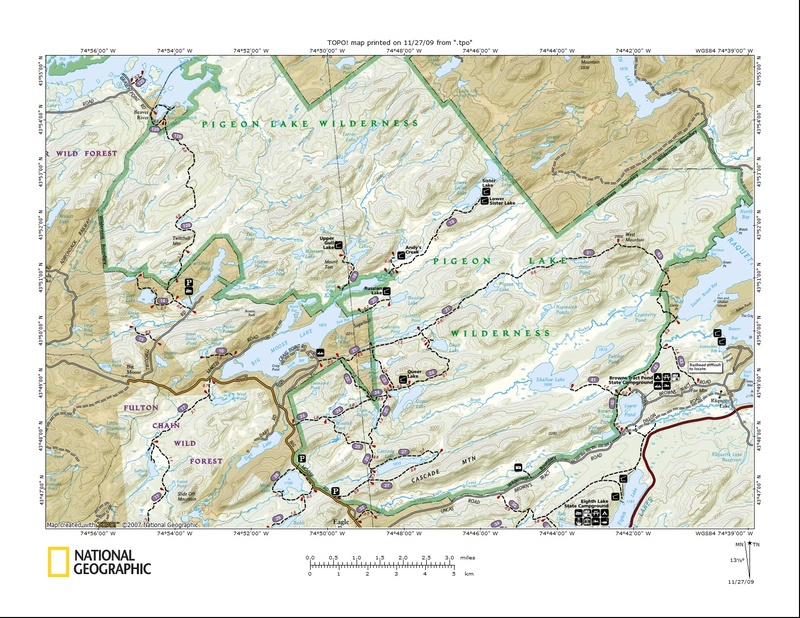 Maps that include the trails may be purchased as a cell phone app from the Adirondack Mountain Club website and may be available from Ranger stations. National Geographic sells a comprehensive book of Adirondack Trail Maps in conjunction with the Adirondack Mountain Club that shows all of the trails. Some of the most popular hiking routes are favorites for cross-country skiers. The Cascade Lake Loop is relatively flat and usually in good shape. The trail includes four small foot bridges over brooks and has boardwalk areas across some swampy spots. At the end of Cascade Lake is the 40-foot waterfall that inspired its name. In summer, more hikers attempt this six-mile loop than any other, but hikers may still find themselves alone on the trail. The trailhead is located at the parking area on Big Moose Road. The most easily accessed lean-to camping shelter is located on the shores of Queer Lake. The trailhead is located off County Highway 1, but the trail can also be reached via a sidespur trail from Cascades lake. One of the most difficult is the trail that leads to the summit of West Mountain, the 2,902-foot high point within Pigeon Lake Wilderness. This, with several other trails, is best accessed from Browns Tract Lakes Campground, a small state-operated campground at the edge of the Wilderness. Within the campground, the Shallow Lake Trail starts hikers toward the intersection with Sucker Brook Bay Trail, which crosses Black Mountain Trail. A second trail leads from the summit of West Mountain to Constable Lake. Trout fishing is very good in some of the wilderness brooks. All proper fishing licenses must be carried and all regulations observed. This is bear country, and precautions should be taken to avoid confrontations. The second-growth forest gives way to stands of old, first-growth trees and standing deadwood in swamps, providing plenty of habitat for songbirds, particularly woodpeckers. Certain areas are used by hunters during large game season, although many aren't prepared for the effort of hiking into more remote areas. No motorized vehicles are allowed anywhere within the Pigeon Lake Wilderness. With no lodgings other than primitive camping within the Pigeon Lake Wilderness, the trails are more suitable for a day visit or a weekend adventure. In close proximity, however, are several popular vacation destinations in the central Adirondacks: the Fulton Chain of Lakes, Raquette Lake, Blue Mountain Lake, Sacandaga Lake and Indian Lake. All are vacation destinations well-known for watersports, guest rentals and a variety of entertainment and cuisine. The Fulton Chain of Lakes is noted for excellent canoeing, with serious paddlers exploring the entire chain. Fishing is excellent, and a number of campgrounds provide budget lodgings to the adventurous. Raquette Lake has a marina that rents boats to those wishing to enjoy the nearly 100 miles of shoreline, and both private guest rentals and campgrounds provide plenty of lodging choices. Near Raquette Lake on beautiful Sagamore Lake, Great Camp Sagamore-former 'camp' home of the Vanderbilt family-is open for tours and an enjoyable piece of Adirondacks history. Nearby Indian Lake also offers plenty of lake-focused activities, including boating, swimming and fishing. Caves in the area are of interest to cave explorers and offer great spelunking. The Adirondacks Museum at Blue Mountain Lake is less than 30 miles from Indian lake. Blue Mountain Lake has several rustic resorts that offer lodging. Guest cottages and private vacation rentals are also found along the lakefront. Boat tours are a popular way to see Blue Mountain Lake from the decks of refurbished 1916 lake cruisers. And for mountain climbers, nearby Blue Mountain is a favorite two-mile hike with a spectacular view of surrounding mountains and lakes as seen from the top. So, come visit Pigeon Lake Wilderness and its lakes. It's an unforgettable piece of unspoiled wilderness. this Lakes of Pigeon Lake Wilderness page.